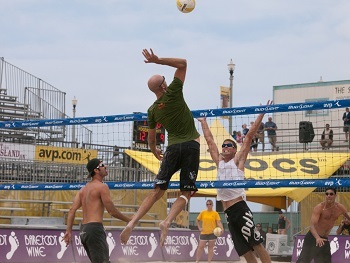 Volleyball hitting techniques are often the hardest skills to master when it comes to learning beach volleyball. Consistent approach, armswing, vision, and spiking with deception are keys to successful hitting on the beach. One characteristic of a great beach hitter is the ability to consistently approach hard every time, making your opponent think you are going to hit hard every single time you approach. If you don't approach hard, the defense will go into scramble mode and get ready to anticipate a shot instead of a hard hit. The key is to freeze the defense with your approach and armswing. Every approach and armswing should look exactly like the previous one. Any deviation in your approach or armswing sends clues to the defenders about what you're going to do. It's only at the very last second when you contact the ball that the defense can tell what you are doing. By this time, it's too late for the defense to react. Another key point: Remember to jump to maximum height or near maximum height every time you approach. This is very important in convincing the defense you're going to swing hard. You want to develop an array of volleyball hitting options. The more options you use, the less predictable a hitter you'll be. Also, each opponent you face will have unique strengths and weaknesses. If you have many hitting options, you can concentrate on using specific hits against certain teams. Hitting line" basically means the ball travels parallel to the sideline. For example, if the left side hitter hits line, the ball usually travels outside the blocker or over the blocker to zone 1 near the sideline. If the left side hitter hits the ball "angle", this usually means the ball travels inside the blocker or over the blocker to zone 5 or zone 4. "Angle" or "cross court" is usually the safer hit because most hitters have an easier time keeping the ball in bounds when hitting cross court. The best hitters can comfortably use any of these 7 options depending on what the circumstances call for. If you can hit the ball hard line, getting the ball past the blocker, you'll likely get many kills because this ball is usually much more difficult to dig. Most great players become comfortable hammering the ball cross court. Keep the ball just over the block. For this shot to be a success, the behind-the-block defender must believe you are going to hit hard. Be sure to keep this ball just over the block, flat, and deep. Don't make the mistake of getting this ball too high up in the air or a great defender will run it down. This is a good shot to go to when you're in trouble. Be sure to keep the ball in the corner and fairly flat. Keep this shot flat and sharp. A good cut shot can give even the best defensive players trouble. The short cut shot lands mid-net, about 3 or 4 feet off the net. This shot is particularly effective in transition situations. Vision basically means being able to "see the court". When you're shooting the ball, if you can see the behind-the-block defender, it's then just a matter of placing the ball where the defender isn't. If you decide to hit the ball hard, you must see the block and drive the ball away from the blocker. See the "Court" or the "Block"
Also, you need to be prepared for when the blocker decides to pull off the net and play defense instead of attempting to block. If the blocker decides to pull, and you're able to recognize this happening, you can drive the ball down the middle or make the pulling blocker try to dig the ball. Very few players can dig the hard driven ball while pulling off the net, especially if they have to reach to make the play. Being able to "read" the play is one of the most difficult skills to develop in doubles volleyball. Many players wail away at the ball and just hope they don't get dug. Developing good court vision eliminates this risk. The key to successful off-speed shots is making the behind-the-block defender believe you are going to hit the ball hard. The belief freezes the defender just long enough for the shot to be successful. Also, there will be situations where you won't be able to hit the ball hard. In these circumstances, the defender is only thinking about running down your shots. Therefore, you must be deceptive. For example, you can make it look like you're going to hit the ball angle, then at the last second hit down the line. It is in these situations that having an arsenal of shots that you can pick from will allow you to sideout comfortably, even in difficult situations. Give a maximum or near maximum jump every time. Master the seven volleyball hitting options. Be deceptive on your hits.